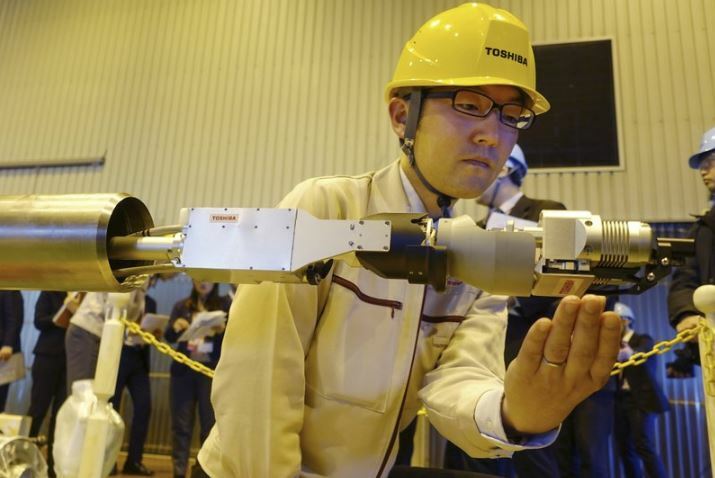 Toshiba has unveiled a remote-controlled robot it hopes will be able to probe the inside of one of the three damaged reactors at Japan’s tsunami-hit Fukushima nuclear plant. The device displayed is designed to slide down an extendable 11-metre long pipe and grip highly radioactive melted fuel inside the Unit 2 reactor’s primary containment vessel. An earlier robot captured images of pieces of melted fuel in the reactor last year, but other details of the fuel’s status remain largely unknown. Toshiba’s energy systems unit said experiments with the new probe planned in February are key to determining the technologies needed to remove the fuel debris, the most challenging part of the decades-long decommissioning process. Japan shut down all its nuclear reactors after the 2011 accident but has restarted five of them. With up to four reactors operating last year, they accounted for less than 2% of the country’s power. A massive March 2011 earthquake and tsunami caused meltdowns at three reactors in the Fukushima nuclear plant, forcing tens of thousands of people to evacuate due to radiation leaks or concerns about the impact on health. Government, parliamentary and private investigations blamed an inadequate safety culture at the plant’s operator, Tokyo Electric Power Co (Tepco), as well as its collusion with regulators, leading to nuclear safety and regulatory reforms.